AVEENO's Clear Complexion Clear Complexion Daily Cleansing Pads (about $6) are (dual-textured cleansing pads pre-moistened with natural soy and salicylic acid, a blemish-fighting ingredient to help clear and prevent breakouts and help improve the skin's clarity and even out tone and texture. These pads are textured on one side to gently exfoliate and smooth on the other side to lift way dirt, oil, and makeup that can clog pores and cause breakouts. They are hypoallergenic, oil-free, and soap-free - gentle enough for everyday use and sensitive skin. Because I'm an AVEENO Ambassador, AVEENO sent me these lovely cleansing pads to try. I think cleansing pads are the best thing ever for times fatigue makes even before-bed or early morning cleansing a dreaded chore. Salicylic acid, one of the ingredients in AVEENO's Clear Complexion Daily Cleansing Pads, and I don't get along, so I asked a friend at work - let's call her Goldie - to test them for me. Goldie's review follows. I met Charlestongirl at work last year and we became great friends. She brought perfume samples in her first week at work (wouldn’t you know it?) (Note: This is not what made us friends, but it helped.) Despite being 29 (at the time) and generally beauty-illiterate, especially when it comes to the likes of Bottega Veneta and other fine brands, I graciously took what she had to offer. Lucky for me she’s never stopped. 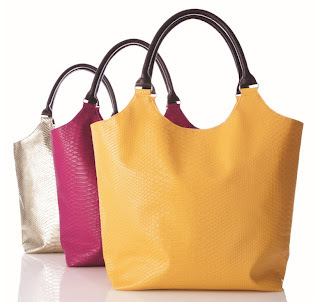 After seven months, I’ve accumulated a small box of perfume samples, some make-up, a pair of By Terry purple flip flops, and two faux snakeskin-textured Neiman Marcus totes, pink and gold, that I adore and use for everything. 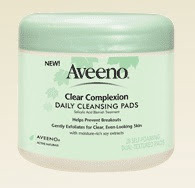 The latest freebie was perfect for me - AVEENO Clear Complexion Daily Cleansing Pads. These things are awesome! I have struggled with acne my whole life, and although I’m pretty much in the clear now, this summer has ignited a real comeback. That is how I know these cleansing pads really work. The packaging touts self-foaming, and that was the first thing I noticed. You only need one pad (no water required), and it takes only a couple of swipes to work up a lather - way more lather than my usual face wash. The pads themselves have a beautiful, clean, and light aromatic smell like all AVEENO products, which is a big reason I buy them. What I loved most about them was the dual-textured surfaces. After weeks of using these, my skin feels clean, extremely soft, and surprisingly renewed, which I attribute to the tiny bumps on the pads that scrub away old skin to bring new skin to the surface. The best part is they’re quick and easy to use when you come home from a night out and want nothing more than to fall into bed. I highly recommend AVEENO's Clear Complexion Daily Cleansing Pads to anyone with adult acne, oily skin, or who appreciates a mini-facial. I did some research on where you can find these, and they seem to be everywhere: Walgreens, Target, the usual suspects. I’m also dying to try the other products in the Clear Complexion line that I found on the Aveeno Web site (Ed. note: Goldie has them now). Has anyone else tried this product or any of the other Clear Complexion items? What did you think? Also, I’m looking for some good age-defying products, so please let me know if you can recommend any that work really well. I am 30 now! I would like to try this. :) Thanks for sharing btw.